Hey guys, I wanted to share an outfit with you that I wore a few weeks back when Chase and I went out for lunch and had some errands to run. Almost always when we run errands, I throw my hair up, put on sweatpants and call it a day. But since we had plans to go out for lunch, I felt like spending a bit more time getting ready. I paired the graphic tee with a pair of black distressed denim shorts, zebra print loafers, and gold jewelry. 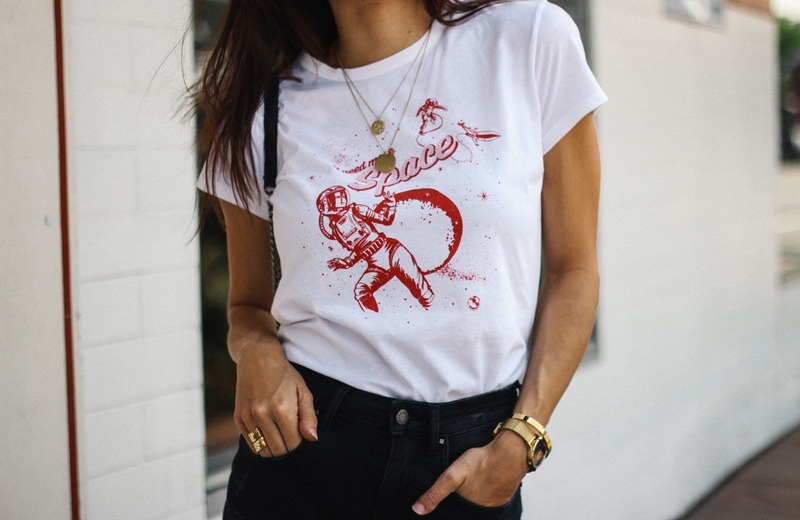 The tee reads "I need more space", which I thought was super cute and clever with the astronaut on it. The first day I wore it Chase said, "are you trying to tell me something"?! Too funny. The loafers I picked up earlier this year from Mango, which you can grab here. l really love how the zebra print loafers add a bit of character to a simple t-shirt and denim look. Have an awesome week everyone :) Thanks so much for stopping by! Such a great look! Love the graphic T and cute zebra loafers!